The Tai Chi Club aims to promote and popularise the traditional art of Yang style Tai Chi Chuan. Club members are shown how the practice of Tai Chi can improve one’s health and also simple self-defence applications. Studying or working at Monash University? Come and join today! 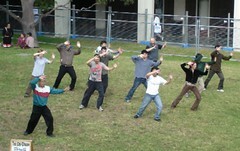 Monash Tai Chi Club has a new 'bloggy' home! HOWEVER.....we have a new home! The new look, highly funky Tai Chi Chuan Club website is now HERE! 1. Bookmark it! Lots of info and news events will be available on the new site! 3. Subscribe using your email address (just type in your address and hit subscribe) to receive notifications of new info on the site....! ...I'll keep this old site up for a longer bit longer...for posterity. CIAO! New look Tai Chi web log! I've just updated the look and functions of our Tai Chi blog here...how do you like it? It's quite easy to change (a Blogger template! ), so feel free to leave a comment about how you like the look! There is now a comments feature (in-built from Blogger) for each post. You can leave comments anytime! I've also set up a Flickr account where photos can be stored (this is my account, but do we want a separate Tai Chi account? )...the demo photo comes from the Flickr site and you can blog directly from Flickr into this Tai Chi blog! Cool huh?! You'll note the polling feature on the sidebar...this will change periodically. If you have any ideas for polls that are fun, easy, and also help members out a bit too (info and the like), please let us know! There is also a subscription feature (powered by Bloglet) which you can sign up to, to receive updates of this blog at your email address - very convenient if you want to stay in touch with news and information about the Club! Our outdoor training sessions-come-demonstrations were a great success! Thanks to members who were able to make the two days around lunchtime - your involvement is much appreciated, thank you! We were able to capture some of the demo with photographs and short movies too. We will publish some of these to this site, once we have permission from members and Sifu to do so...so, stay tuned!! We hope to have another demo before semester 2 as part of our semester 2 memebrship drive! Hope to see as many members as can make it once again! A successful AGM! ...thank you everyone! Thank you to all members who made it for the AGM. We voted in our new office bearers for 2005. Brendan was re-elected as Club President - congrats Brendan! Congratulations to our new officebearers and thanks to the members for making your vote count! Please feel free to approach the officebearers about your thoughts, ideas or comments about the Club. Remember it's your club and we want to run it in the best way that suits club members. You can also post comments to this blog too, if you have suggestions, etc. We look forward to hearing from you and talking with you at training. 2005 AGM this Thursday, May 12th, 5pm! We hope as many members as possible can come along this Thursday to be present for our 2005 Club Annual General Meeting (AGM). This meeting will see a changeover of Club Officer Bearers to replace those (or be renewed) from 2004. Voting for these positions will take place during the meeting. An agenda has been emailed to all Club members who have rpovided an active email address. If you have not received an agenda by email, there will be copies available at the meeting on Thursday. We hope you can attend...see you there! get to know and enjoy the company of your fellow club members for the day! There will be a small fee on the day of $20 (plus $5 if staying for dinner!) to cover room hire and coaching fees. We will end the day with an early dinner (pizza or something) and perhaps some videos/DVDs (we might be able to convince Sifu to show one or two of his tai chi videos)! If interested, please contact Brendan or Marg via email or at training, by Thursday May 5th. We will need final numbers in order to maintain our booking. At a recent session, Sifu John talked about maintaining a rocking motion in the easy tai chi form, calling it Chan Su Chin or Chan Xu Jing, depending on your Chinese - please correct me if this is incorrect! It's kind of like weaving a silky cocoon - not sure of the exact translation...anyone want to have a try? Leave your translation in the comments area at the end of this post! Sifu was referring to the softness and smoothness of the movements of each posture and the connecting movements between postures in the easy tai chi form. Sifu considers this one of the fundamentals of Yang style T'ai Chi Chu'an. It reminds me too of the saying: smooth as silk and also light as a feather! You may notice this too when you are doing pushing hands. The following link shows a slideshow of Master Chen Wei Ming doing the Tai Chi form. Chen Wei Ming was the senoir student of Yang Chen Fu, the great master of what is now our Yang style T'ai chi today! Those of you who are interested in doing a tai chi demo and can be available on Tuesday May 17 at 1-2pm and/or Thursday May 19 12-1pm, please contact either Brendan or Marg via email or at training. It would be great to have 10-15 people (or more!!) from the club join in the demos so we can also show the strength of the club as well as the great progress everyone has made in the form!